There are four basic elements of disability-friendly design that need to be considered. These are the removal of obstructions, the making of small changes to aid movement, the modifying of existing elements, and the renovation of existing spaces. While these may sound like drastic measures, it is possible to combine all of these elements yet still retain the occupant’s individual interior decorating style and taste. These can include rugs that may inhibit the function of a wheelchair, floor tiles that could cause trips and falls, and furniture that is simply in the way of a thoroughfare. Once such obstructions have been identified, it needs to be decided which can be done away with to remove the potential problem, or repositioned so that the problem no longer exists. Is a side table essential or is it just ornamental? Can a sofa be placed against a wall to create more room? Such removals can also make an interior appear less cluttered and more attractive. Small changes to create a disabled-friendly home can include changing the storage of commonly used utensils and cooking pots in the kitchen. 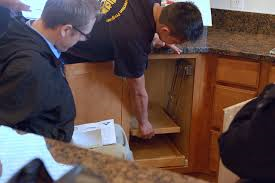 For example, instead of such items being in a cupboard at shoulder height, they can be put in low cupboards or drawers that are accessible to people sitting in a wheelchair. It can also mean putting down wheelchair ramps to make rooms and outside places easier to access. This is a step up from the small changes element, and can include the installation of handrails in certain strategic points, the laying down of ramps, automatic doors that makes ingress and egress easier, and flooring that is better suited to wheelchair use. Modifications can also apply to items of furniture, such as the use of an adjustable bed, ideal for those who have difficulty lowering themselves into a bed or getting out of one. Some homes may need major renovations to make them more suitable for a person with a disability. Such renovations can include the widening of hallways and the drastic redesign of bathrooms and kitchens so that wheelchair users can get around more easily. Renovations can include the installation of state-of-the-art equipment that utilizes digital technology rather than manual handling, so that people with weak muscles can operate them with greater ease. In the bathroom, a bathtub can be installed that has a door in the side so that people who may have trouble moving their limbs can get in and out of the tub easily. Many alterations and adaptations can be made to the home to make it easier for a person with a disability to navigate, as well as making the home look like a place of familiarity and comfort. I am always looking for any tips that can make my crib more spacious. Thanks for the ideas.